This table includes a 4′ round table and a white vinyl patio umbrella and are great for barbeques on hot, sunny days! We also carry linen for these tables available in white or red & white checked which are rented separately. SKU: PGE02. Categories: Party & Event, Tables, Chairs, & Tents, Tables. Tags: patio table, picnic table, umbrella table. 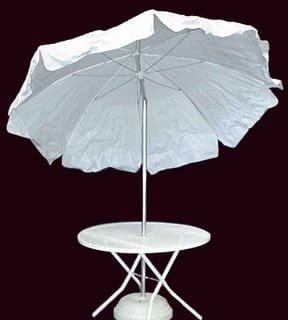 This umbrella table includes a 4′ round table and a white vinyl patio umbrella and are great for barbeques on hot, sunny days! We also carry linen for these tables available in white or red & white checked which are rented separately. This frame canopy is a commercial grade tent meant for higher wind speeds. This tent can either be staked down into grass or dirt or it can be weighted down if staking is not an option. If the canopy is weighted down, there is an additional cost of $180 per 20′ x 20′ frame canopy needing weights. These tents can be connected together to make larger tents in 20’x20′ increments (20’x40′, 20’x60′, 40’x40′, etc). Delivery and set-up are required by All Seasons Rent All for this canopy type. Delivery charges are additional and are based on distance from our store. Set up and tear down of this tent are included in the price of this tent. Sidewalls, lighting and heating are also available for this tent and are rented separately. This tent can also be raised higher using extension legs. No cooking or grilling can be done under this or any canopy. This is a homeowner type center pole canopy that can be easily installed by 2 strong people in less than an hour. This canopy requires an open area of at least 25′ x 25′ in which stakes can be driven. This style canopy must be set-up in grass or dirt where stakes can be driven into the ground. This type of canopy is safe in winds up to 20mph. If winds exceed 20mph, this tent MUST BE TORN DOWN. This type of canopy cannot have sidewalls attached to them. No cooking or grilling can be done under this or any canopy. All Seasons Rent All does not offer set up or tear down of this type of canopy. This is a homeowner type center pole canopy that can be easily installed by 2 strong people in less than an hour. This canopy requires an open area of at least 30′ x 30′ in which stakes can be driven. This style canopy must be set-up in grass or dirt where stakes can be driven into the ground. This type of canopy is safe in winds up to 20mph. If winds exceed 20mph, this tent MUST BE TORN DOWN. This type of canopy cannot have sidewalls attached to them. No cooking or grilling can be done under this or any canopy. All Seasons Rent All does not offer set up or tear down of this type of canopy. This pop up canopy is a light-weight canopy good for sheltering small set-ups such as food tables or art displays. They set up and tear down very easily and quickly. They can be set-up by two people in less than 2 minutes. This canopy requires an open area of at least 11′ x 11′ to be set up in. Sidewalls, lights, and tent heaters are also available for this canopy! They include 4 water weights with straps to help weight the canopy down (you will need a water source to fill the weights). With the weights filled and attached, the canopy is safe is winds up to 20 mph. If winds exceed 20 mph, the tent MUST be torn down. No cooking or grilling can be done under this or any canopy. All Seasons Rent All does not offer set up or tear down of this type of canopy.